One of the Europe’s most visited and vibrant city of Barcelona, where you can spend your whole lifetime but never get bored of its beauty and charm. Whether your liking is for culture, nightlife, history, good food, architecture or just for relaxing whole day near the beach, you will feel at home over here. You can also find many right places nearby Barcelona, where you can also pay a visit. This is an ancient town called Girona which is a really beautiful place for visiting, so that you may escape from the hustle and bustle of Barcelona. There is a stunning cathedral, Arab baths, Benedictine monastery and one Jewish museum where you can find details about the Jewish history who had lived there till late 1400s. You can visit Girona by train which goes after every 10 minutes and take you there within 38 minutes. Figueres is famous for its splendid architecture, which also includes Castell-de-Sant-Ferron of 18th century. Another well-known theatre-turned-museum known as Teatre-Museu Dalí. This theatre was converted by Salvador Dalí himself, and in the inside, there are lots of works of art, statutes and sculpture. Few street-side cafés and few popular restaurants available at Figueres which will offer you a nice break. You can go by train there and it takes 1 hour and 45 minutes and train go in after every 1 hour. If you are interested to get best views, visit this place which is quite close to Barcelona that has a rocky range. It is a pre-coastal range and you can visit there either by cable car or cog railway to the Montserrat-monastery. For getting the best views, you must take your walking shoes and go straight to the Sant-Jeroni peak. You can get train from Plaza-Espanya and reach to Aeri-de-Montserrat after every half an hour. You can reach Montserrat by one hour and after reaching there look for either the rack railway or cable car. This beautiful town is about 21 miles towards southwest of Barcelona. It is basically a seaside town, and there are more than 12 beaches in this region. You can enjoy beach climate and hence you can make beachside trip during most of the year. There are few more things in the town than only beaches. You can find beautiful avenues and walkable streets, also few museums to visit during your one-day trip. 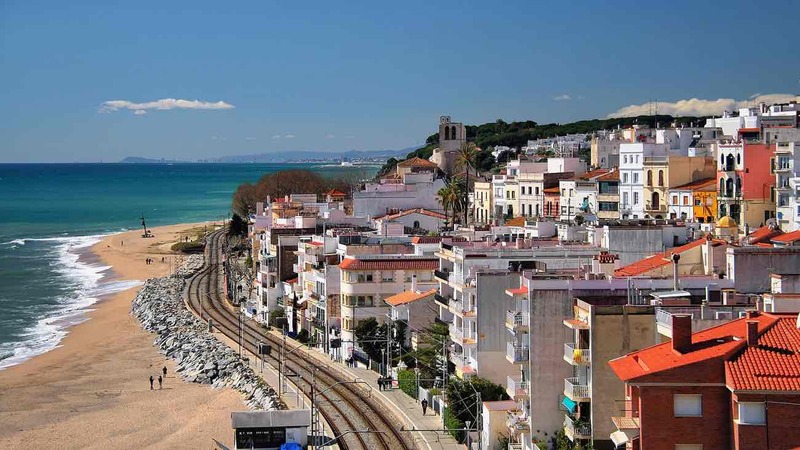 Trains available from Barcelona every half an hour and will take you to Sitges within 45 minutes. If you want to escape from Barcelona’s bustling city life then visit Collserola. The stunning Parc-de-Collserola usually remains packed with walking trails and cycling routes. There are plenty of signposts and also you can get the road map from the information centre. To visit there, take a train starting from Barcelona to Baixador-de-Vallvidrera station. It is only 15 minutes journey and many prefer to walk through the hills to a place called Sant Cugat, and then return by train from there. You can easily reach to this medieval walled town and it has number of attractions that are worth visiting for a day trip. Places like St-Jordi-gates and the Bover-Tower are historic and legendary places. You can also see few Romanesque and Gothic monuments throughout the town. You can get RENFE trains which runs from Barcelona up to Montblanc after every 4 hours. You can make the total journey in just 2 hours only. To know more about various places and book tours near Barcelona, you can also visit the website: http://www.tripindicator.com/barcelona-day-trips.html. You’ll also find relevant information in detail.